Home SBI SBI PO Strategy to prepare for SBI PO exam without coaching? SBI PO is one of the most important government exams in the banking sector. The exam is conducted every year to appoint a number of PO in State Bank of India. As an SBI Probationary Officers, candidates need to carry out various administrative tasks and communicate with the customers as well. To crack the SBI PO exam, a candidate needs to prepare really well. Many candidates join coaching classes for that, but taking coaching classes might not be a feasible option for every candidate due to many reasons. But, does that stop them from trying to crack SBI PO? Absolutely not. SBI PO exam preparation can be taken without any coaching as well. Keep reading as we unveil the tricks for you. Descriptive Test: The Descriptive Test of 30 minutes duration will consist of two tasks, a letter writing and an essay writing. 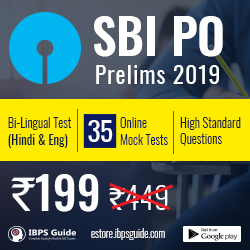 The final Round is the Group Discussion rounds containing 20 marks and a PErsonal Interview round containing 30 marks, together the SBI PO Main score + scores in GD+PI will determine a candidate’s selection as a PO in State Bank of India. Before you start to prepare for SBI PO exam at home, you need to keep a few things in mind that’ll help you to keep going in the right direction. A structured approach to all the subject is necessary for home prep. Most people tend to start with the toughest subject and then move to the easiest one. But, we tell you to do the reverse, always begin with the easiest one because they are quick to understand and won’t take you much time to cover it. Try to complete as many easy chapters/sections as possible and then move on to the tougher ones that will take you time to understand. In this way, if you don’t end up completing the syllabus, you can at least be confident to answer questions from the easy sections that you’ve already covered. Find the right study material to boost your preparation. Research for best SBI PO preparation study material. Don’t restrict yourself to reading good books only, watch video courses, listen to podcasts, discuss chapters in SBI self-preparation online forums and find good Ebooks too. All these different types of study material will help you to cover the exam syllabus without monotony. Practice section-wise mock tests for all the SBI PO exam sections. Attempt time-bound mock tests in order to improve your speed and accuracy, both. With regular practice, you can easily answer all the SBI PO test questions within the stipulated time. This is a very important point to remember and implement. With multiple subjects to prepare in a short time, anybody can feel overwhelmed with the preparation, but, don’t try to prepare everything at once. Take up one subject and try to cover a few topics from it per day before moving to other subjects. After the general study plan, comes the subject-wise plan for more clarity. With a subject-wise plan, you can implement Subject wise, your preparation strategy should be as follows. Read English newspapers and watch news and talk shows on a daily basis. Focus on synonyms and antonyms, prepositions, conjunctions, tenses, etc. Learn shortcut formulas to solve longer questions. Solve computer quizzes on a daily basis. Refer to good books for general knowledge of computer software and hardware. Jot down important points related to every topic and revise them regularly. SBI PO preparation is a time-bound process and can be covered in time if you start preparing with the correct strategy. Usually, SBI gives 2-3 months after it releases the SBI PO notification every year, so candidates can utilize those 90 days to cover the entire SBI PO syllabus and write the exam well.